Gwefan (the Welsh word for "website") is a straight forward content management system for small websites. It was designed with great simplicity in mind, so that once set up it would require no more knowledge to operate than the most basic experience with a word processor. Many small organisations and private persons could benefit from having a website that is easy to manage and keep up-to-date but do not have the in-house expertise necessary or the money to pay someone else to do this for them. This is where Gwefan comes in. Gwefan's page hierarchy is purposefully limited to two levels and organised into primary "toplinks", each of which can have a number of optional secondary "sublinks". There is no complicated mechanism to modularise or hierarchically organise pages beyond this, as this mostly just adds more difficulty for the user while not required for simple websites. 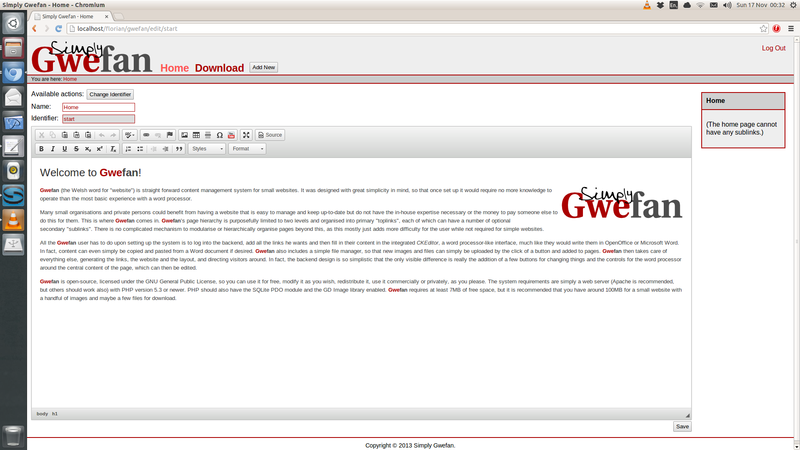 All the Gwefan user has to do upon setting up the system is to log into the backend, add all the links he wants and then fill in their content in the integrated CKEditor, a word processor-like interface, much like they would write them in OpenOffice or Microsoft Word. In fact, content can even simply be copied and pasted from a Word document if desired. Gwefan also includes a simple file manager, so that new images and files can simply be uploaded by the click of a button and added to pages. Gwefan then takes care of everything else, generating the links, the website and the layout, and directing visitors around. In fact, the backend design is so simplistic that the only visible difference is really the addition of a few buttons for changing things and the controls for the word processor around the central content of the page, which can then be edited. Gwefan is open-source, licensed under the GNU General Public License, so you can use it for free, modify it as you wish, redistribute it, use it commercially or privately, as you please. The system requirements are simply a web server (Apache is recommended, but others should work also) with PHP version 5.3 or newer. PHP should also have the SQLite PDO module and the GD Image library enabled. Gwefan requires at least 7MB of free space, but it is recommended that you have around 100MB for a small website with a handful of images and maybe a few files for download. Copyright © 2019 Simply Gwefan.